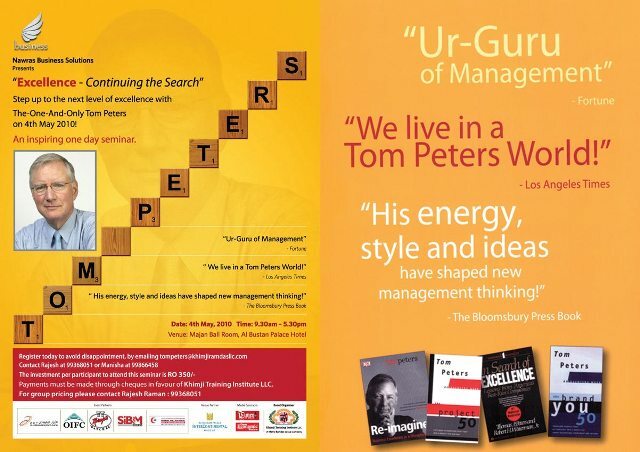 Management guru “Tom Peters” will visit Oman for a one day exclusive seminar themed “Excellence-Continuing the Search” organized by Khimji Training Institute. This Inspiring one-day seminar will take place in the Al Bustan Palace Hotel, Muscat, on 04 May 2010 from 9.30 am to 5.30 pm. This one of a kind, hi-profile visit is aimed at extending benefit to top management professionals including senior leaders from Business, Corporate, Ministries and Government establishments.